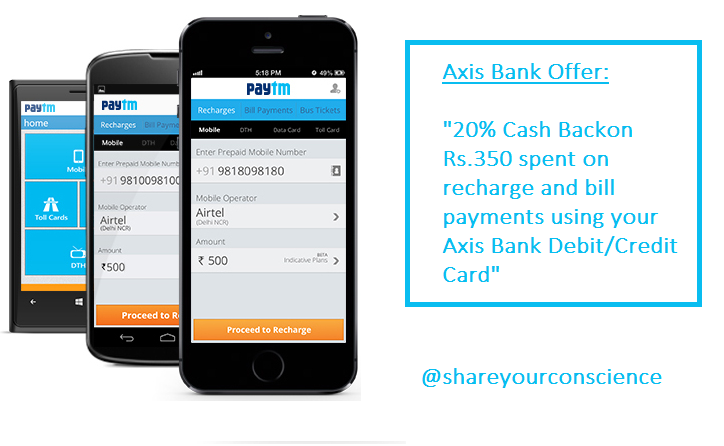 PayTm offers a great discount coupon on online prepaid recharge for axis bank debit/credit card user. 1. Go to Paytm for recharge. 2. Register with your Facebook/Gmail account. 3. Apply Coupon code: PAYTMAXIS20. 1. This offer is only available for new Users. 2. The limitation of this offer is that 20% cash back is valid on minimum 350 Rs spent. 3. You have to use promo code before payment otherwise you shall not receive cash back.